Thank you for visiting another one of Quality Auto Center's online listings! 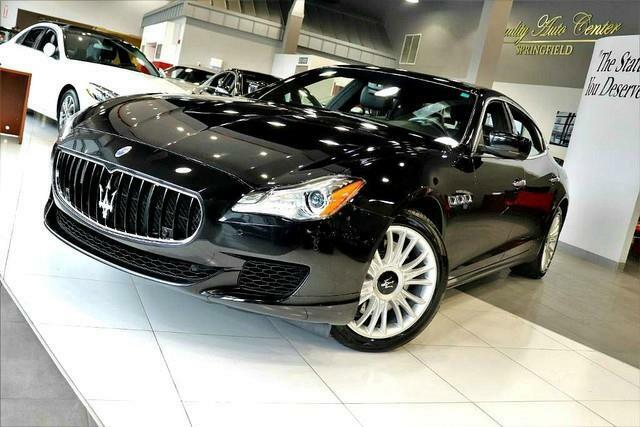 Please continue for more information on this 2014 Maserati Quattroporte S Q4 with 14,956mi. This Maserati includes: HEATED REAR BENCH SEAT Heated Rear Seat(s) Rear Bench Seat POWER REAR SUNBLIND ALCANTARA HEADLINER EXTENDED KEYLESS ENTRY INCLUDING REAR DOORS Power Door Locks Keyless Entry HEATED LEATHER COVERED THREE SPOKE STEERING WHEEL W/WOOD INSERT Leather Steering Wheel *Note - For third party subscriptions or services, please contact the dealer for more information. * Indulge yourself with one of the most highly crafted, most luxurious automobiles available today. Once you see this Maserati, you'll quickly see that this is the perfect vehicle for the outdoor junky! You'll even feel relaxed knowing that this All-Wheel drive vehicle will get you to where you are going no matter what may come your way. Also, with this Maserati Quattroporte's dependable control you'll be able to drive into the sunset without a care in the world! Exceptional in every sense of the word, this incredibly low mileage vehicle is one of a kind. Left your phone at the restaurant? No problem. With the navigation system on this Maserati Quattroporte, you'll be able to quickly find your way back to get it. Marked by excellent quality and features with unmistakable refined leather interior that added value and class to the Maserati Quattroporte More information about the 2014 Maserati Quattroporte: The Quattroporte starts at just over $100,000 with V8 models starting at around $140,000, so an exclusivity is a given. The Quattroporte aims to compete with other high performance luxury sedans from Audi, BMW, Mercedes and perhaps most importantly, Porsche. Amongst its Teutonic rivals, the Quattroporte sets itself apart with classic Italian flair and passion. Its styling is neither anonymous nor awkward and it sings its exhaust note rather than muffling it. With plenty of engineering supplied by Ferrari, the Quattroporte is a statement even more than it is a means of transport. Strengths of this model include classy Italian styling, Exclusivity, available all-wheel drive, and powerful and sporty No Credit / Bad Credit / No Paystubs, No problem !! ! All Approved ! Everyone drives ! CLEAN, GORGEOUS, LOW MILES, SHOWROOM CONDITION. CALL NOW QUALITY CERTIFIED up to 10 YEARS 100,000 MILE WARRANTY , To Certify a vehicle, there will be an additional cost for Certification. CALL NOW For details. STUNNING AGGRESSIVE LOOK ON THIS BEAUTIFUL--Call today to schedule a test drive... Good Credit/Bad Credit/No problem!!!! Get paid cash? No problem!! 100% Credit Approval with interest rates starting at 2.49% for qualified customers, our rates will not be beaten. We price our cars at wholesale price to guarantee the best deals for our customers. Our inventory moves quick, please call to confirm the availability of the vehicle of your interest Springfield location 973-564-0112. This vehicle is located at our SPRINGFIELD location. Come visit our new showroom in Springfield NJ.